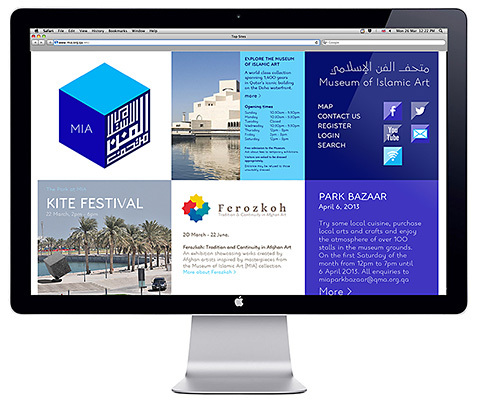 The Museum of Islamic Art, Doha, Qatar. 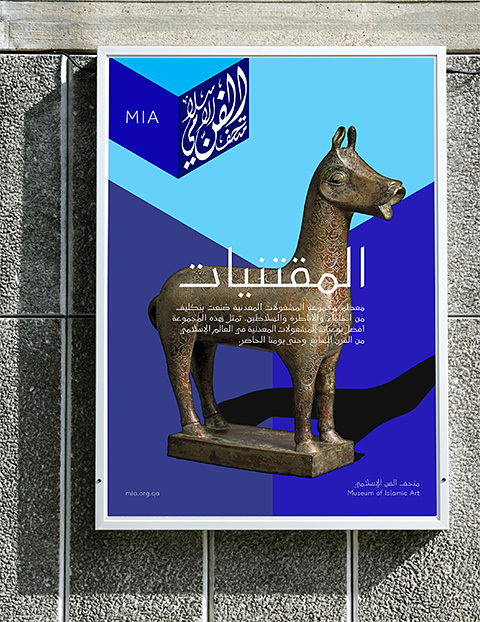 MIA type is a contemporary, bilingual Arabic and Latin type-family based on the Eastern Kufic calligraphic style drawn in four weights: Light, Regular, Bold, and Black. 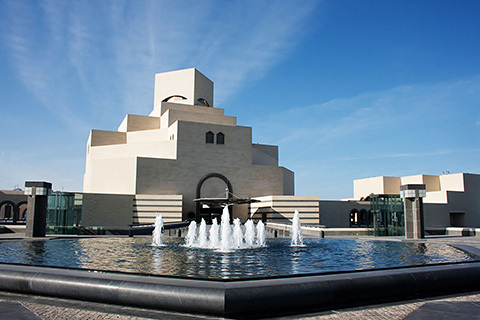 The Museum of Islamic Art building is one of the most iconic landmarks in Doha. 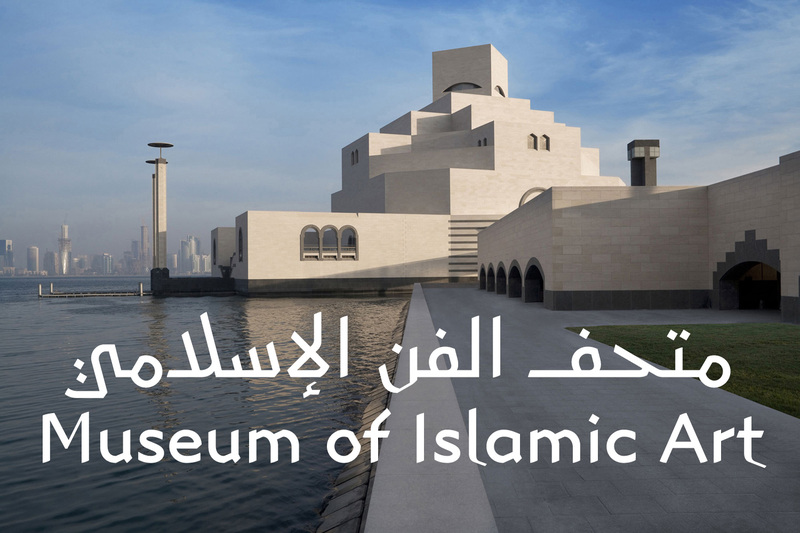 The renowned architect, I.M Pei, designed the museum with clear inspiration from Islamic architecture. He wanted to find the essence of Islamic architecture and to uncover its pure forms. The central courtyard of Ahmad Ibn Tulun mosque in Cairo and Monastir Fort in Tunisia were some of the structures that represented for him the purity and spirit of Islamic architecture. 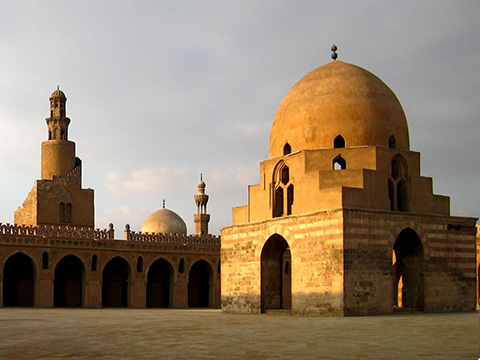 Ahmad Ibn Tulun Mosque in Cairo, Egypt. Back in 2009 I visited the museum and was fascinated as much by the architecture as the Islamic art treasures displayed inside it. The play of light and shadow within the museum spaces as well as the outside facades reveal the museum’s unique characteristics, displaying a balance between light and dark, void and mass, and cubes and flats. 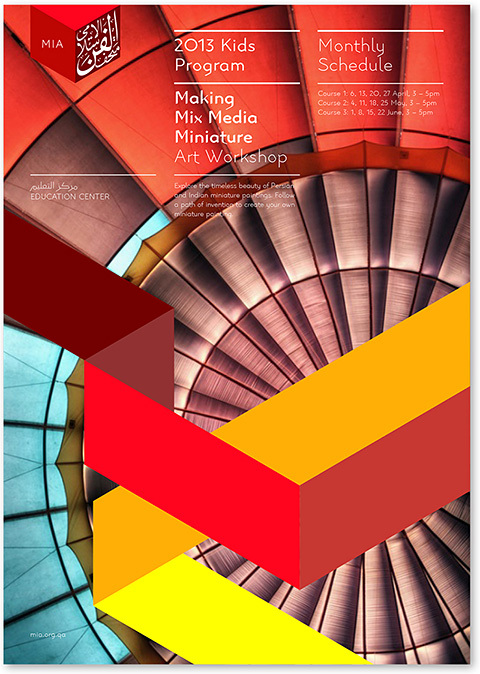 When the time came to work on the corporate type for the museum contracted by the Qatar Museum Authority (QMA), I partnered up with Landor Dubai, since they were handling the overall redesign of the new branding They briefed me on several of the branding models they were working on. 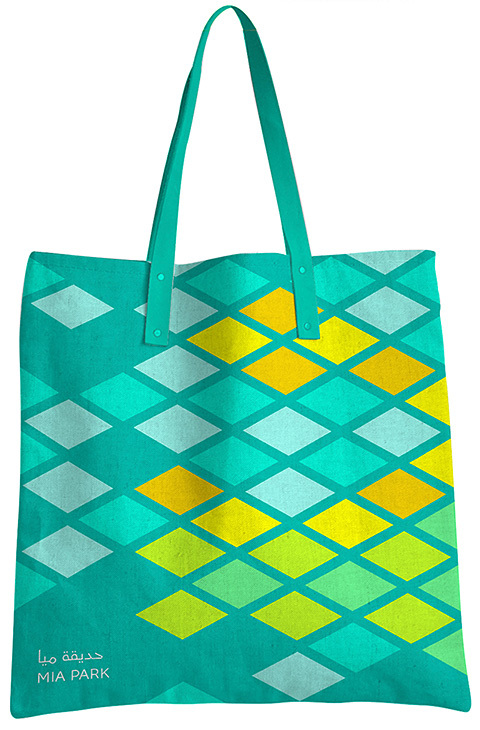 I had the assignment to create type concept/s in support of each of their design approach/es. 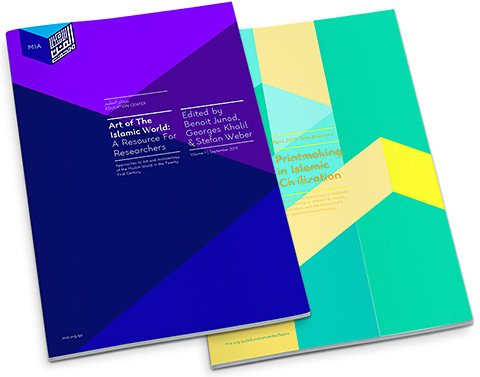 From four design concepts we ended up with one: The Cube; The House of Wisdom; The House of Art & Culture. 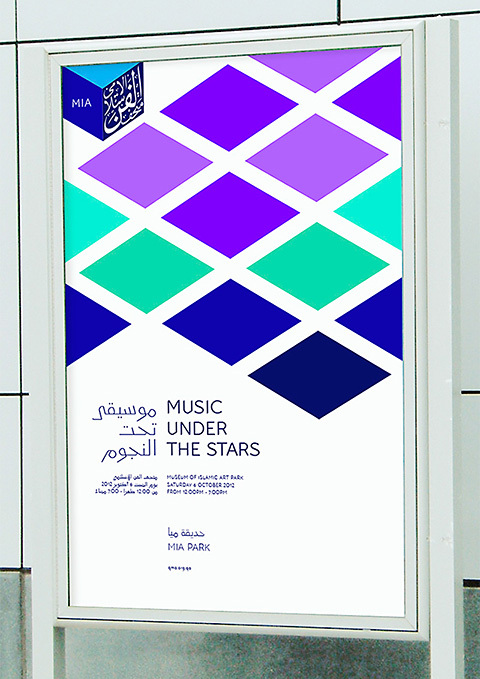 The cube perspective structure, which is inspired from the architecture of the building, became the base unit for the creation of a contemporary arabesque grid that in turn became the concealed structure for the whole new corporate identity of the museum including the custom typeface. 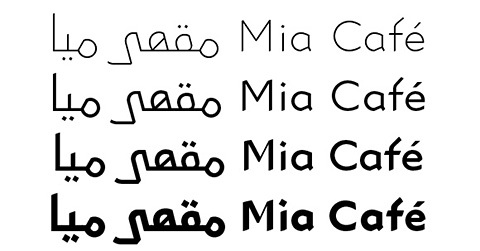 Primary sketches for MIA type with different design approaches. Skeleton sketch trials for MIA type. 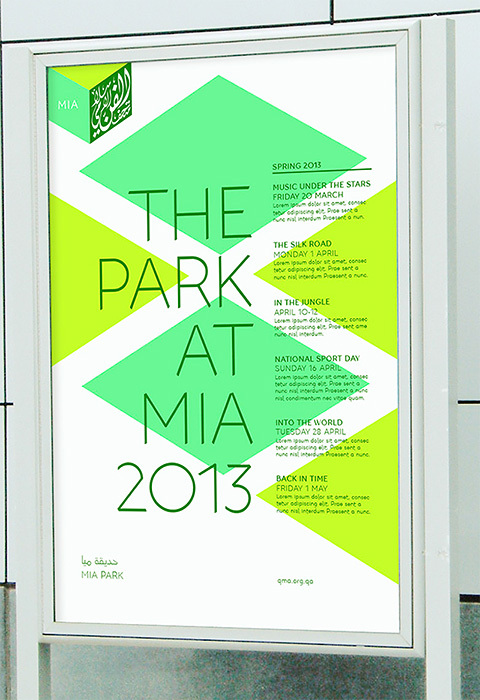 The bespoke MIA typeface had to incorporate the attributes of the design brief by becoming: 1. 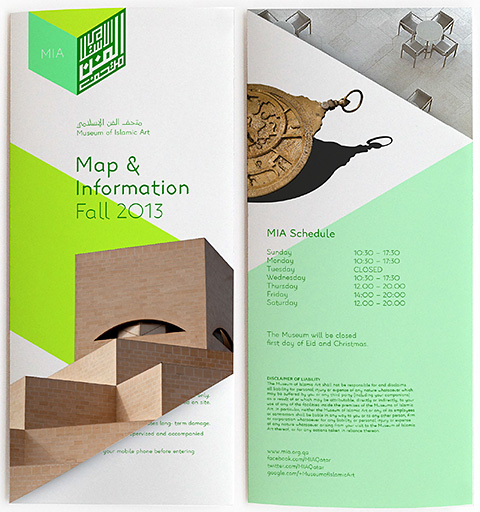 Contemporary type based on the arabesque cubic grid created for the corporate identity, and 2. 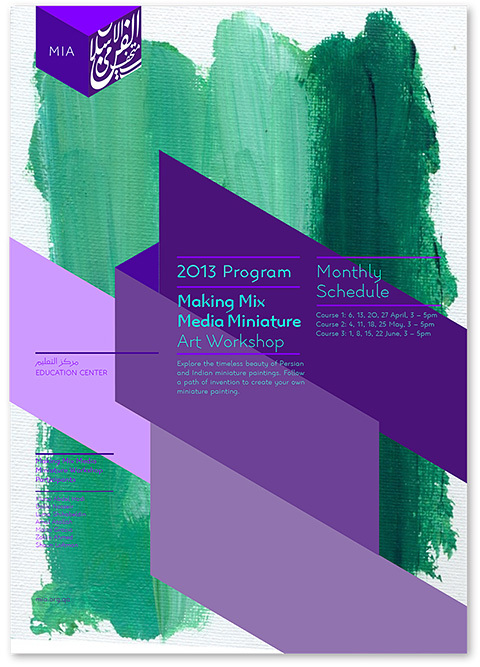 Serious corporate type with a unique geometric quality. Inspired from I.M Pei’s research on the essence of Islamic architecture, I took on the challenge of finding the essence of Arabic calligraphy. 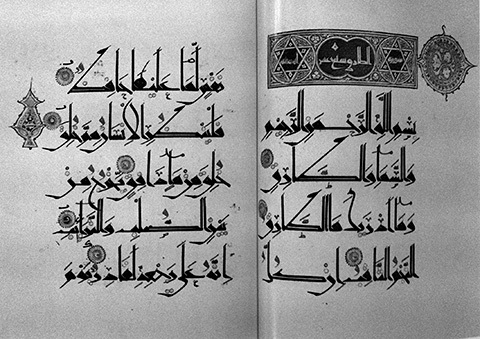 I undertook extended research on Archaic Kufic and Eastern Kufic since the Kufic script is the essence of Arabic calligraphy. 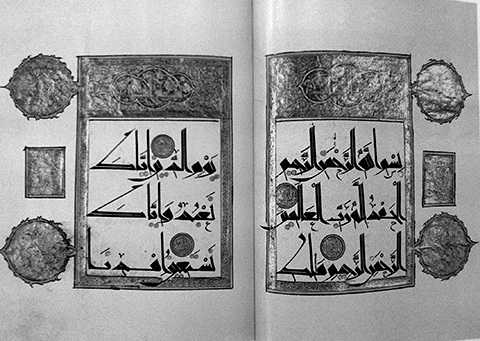 Arabic calligraphy books focusing on manuscript analysis and studies like “Splendors of the Quran Calligraphy & illumination” by Martin Ling and “Ink and Gold: Islamic Calligraphy” by Fraser & Kwiatkowski were the start of my extensive research for the unique Arabic letterforms. Manuscript images compiled from photographs I took in museums around the world in the past years alongside web image databases became valuable sources for the inspiration and sketching phases. 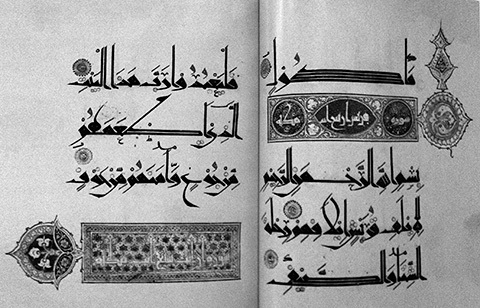 Sample image of an old manuscripts written in the Eastern Kufic Style. After an analytical study of the manuscripts, I produced a matrix documenting the different letter shapes of each of the 29 Arabic letters. I made several drawings for each glyph in order to find the proper solution for the design problematic. 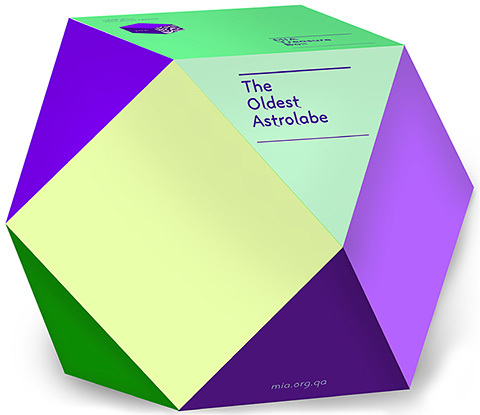 The glyphs had to be developed based on the grid we mentioned earlier, have unique postures, and stay legible and easily recognizable for fast reading. The contrast between the light and shadows in the museum building is transformed into the contrast between the thick and thin pen strokes found in the letters. The heavy letter heads, loops, and bowls were contrasted with ultra-thin finials and terminals that are found in the type. 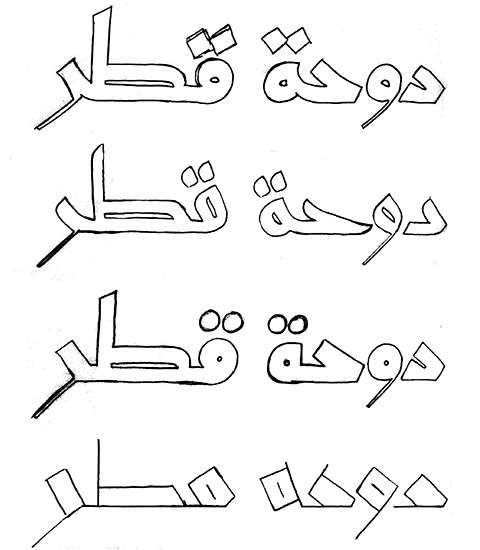 Documentation of some letteforms for the Arabic letter Ha’ in medial position in the Archaic and Eastern Kufic Styles. 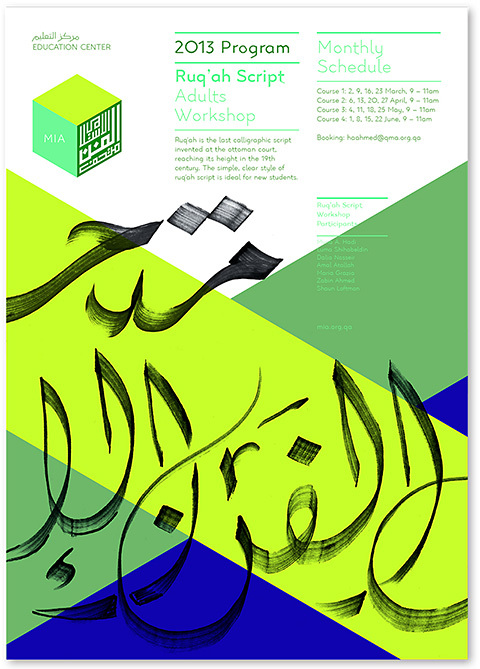 Drawing trials for the medial Arabic letter Ha’. 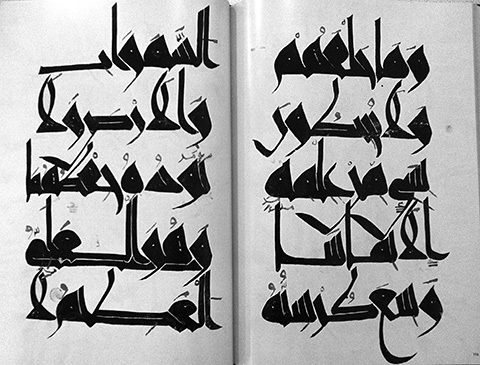 The Arabic and Latin glyphs were drawn simultaneously to ensure the design concept and grid structure worked properly in both scripts. The primary letters were drawn strictly in line with the grid that proved problematic, since some letters looked too rigid or out of proportion. Several trials later, we decided to break away from the grid but keep the basic structure of the letter following the main lines of the cubic grid. 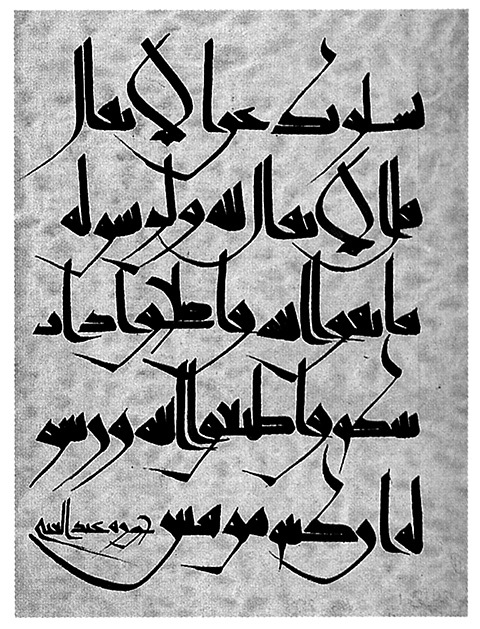 • Some of the verticals in the Arabic letters are straight while others are slanted to the left. The Alef, Tah, Lam, etc. have straight verticals, while the Seen, Kaf, Ra’, Waw, etc. have slanted verticals. 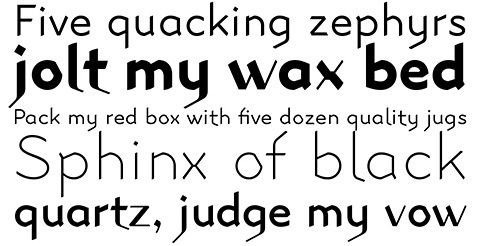 A balance between the straight and slanted verticals needed to be proportionate with the size of the heads, loops, bowls, and bellies of the glyphs. • The bowls in the letters Noon, Lam, Seen, Sheen, Sad, Dad, and Qaf have an extremely open and edgy structure as well as the bellies of the letters Jeem, Ha’, Kha’, Ain, and Ghain. • The Ba’ and Fa’ isolated family have an open-ended horizontal structure without a closing terminal. • No full circular structure is present in any of the heads or loops like the letters Meem, Waw, Fa’, Ha’, etc., but a balanced structure between curved strokes and straight edgy lines giving the counters a unique characteristic and proportional setting. 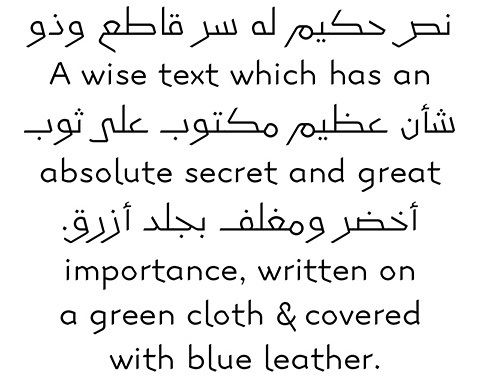 • The Latin counterpart letters were drawn in the same spirit as the Arabic. The counters in the Latin letters like the a, b, d, g, p, q, etc. had to echo the shapes of the heads and loops in the Arabic letters, while the terminal and finials of the lowercase glyphs f, g, j, l, r, t, and y match the look and feel of the open-ended bowls and bellies of their Arabic equivalents. • The finals and terminals in the letters have a unique curved structure with sharp edges. 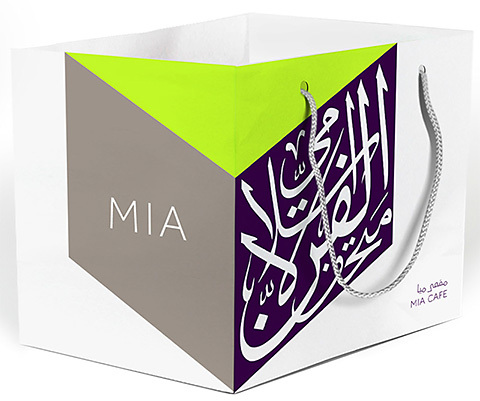 Since the Latin capital letter M is the start of the logotype MIA, several options were made and extensive testing and surveys were done until we got to the final desired shape that all parties could agree on. I could not believe at some point that the capital letter M could have so many alternatives and could be at the heart of so many passionate debates. The type-family consists of four weights: the Light and Regular are mono-linear while the Bold and Black have extreme contrast. Since the Light and Regular were going to be set mostly for running text, we decided to keep them mono-linear in order to preserve the legibility of the font. The typeface already has unorthodox letterforms, which are not very familiar to the standard reader, and adding slight contrast to the light weights would have hindered the reading experience even further. The Bold and Black on the other hand have extreme contrast between the thin and thick stokes since they will be used primarily for display setting and in big sizes. The contrast in the heavy weights gives the font an elegant serious feel, bringing it closer to the traditional Eastern Kufic style. 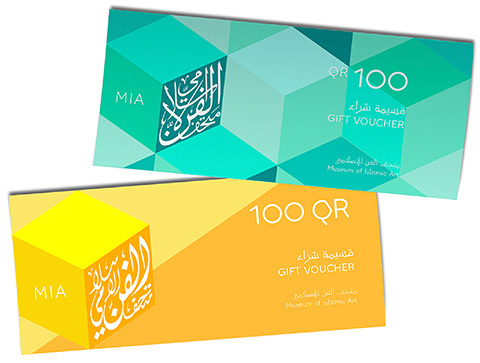 MIA type-family is used for all the newly created branding identity items, publications, signage, web apps and platforms, etc… MIA Café, MIA Gift Shop, The Park At MIA, Education Center, The Library and Auditorium are the different spaces in the museum where the type is applied on the signage as well as for print materials, promotional products and packaging. 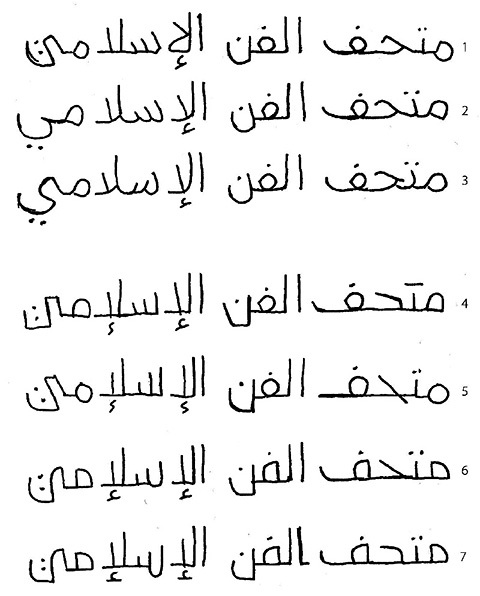 Searching for “eastern kufic” found this page of MIA useful material found. 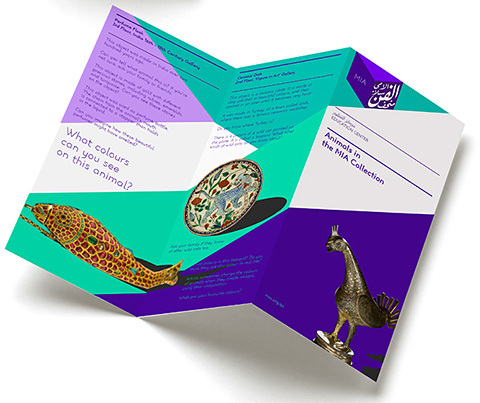 Sr. Paper Conservator/Head of Conservation at National Museum of Pakistan.